How it Happened: "The mayfly hatch," Kelly confessed, "prompted us to go up river to get away from them. Current is always key on the river, and we went river fishing by focusing on the key features in the current." 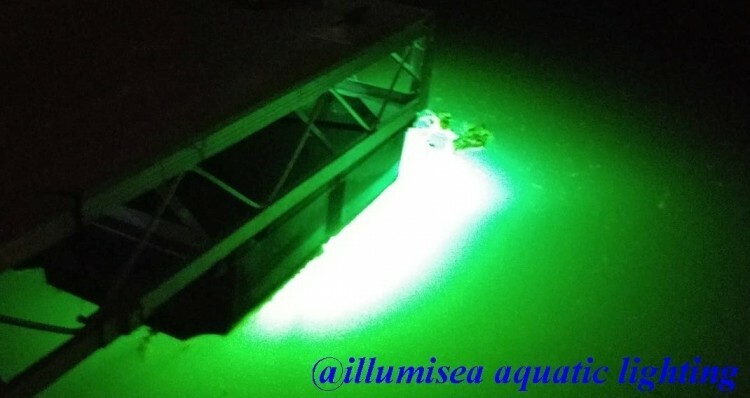 Key features were spots the current positioned fish - logs in current, inside cuts on seawalls, and any slop close to current. How it Happened: It was a long day that ended with a fury. "We spent most of the morning fishing downstream and could not get anything going," admitted Hollabaugh. 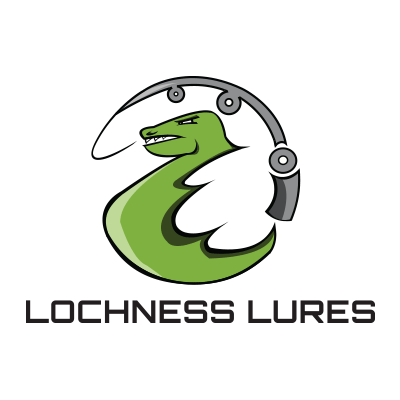 "When we finally went upstream, we found some current and caught some slot fish." How it Happened: DuPont admitted that practice on Friday told the team to focus on, "Lay downs around deeper water." He added, "The islands seemed to produce more fish than the river banks." Kelly said, "We covered a TON of water!" ​Their main key feature was the wood, especially the biggest logs. By 9:30 they completed their limit, and they culled two times. They quickly caught their first keeper on a piece of wood that produced a solid keeper on Friday. They went on to get 4 keeper bites and landed 3 of them. The last was the biggest. DuPont spilled the beans, "I saw a tree sticking out of the water that looked to have a dark spot right at its base (I thought maybe deeper water). I pitched to it and immediately saw my jig swimming. The fish wrapped himself around a log almost immediately. I just kept thinking to myself, don't lose this fish or Andy may push me off of this boat. 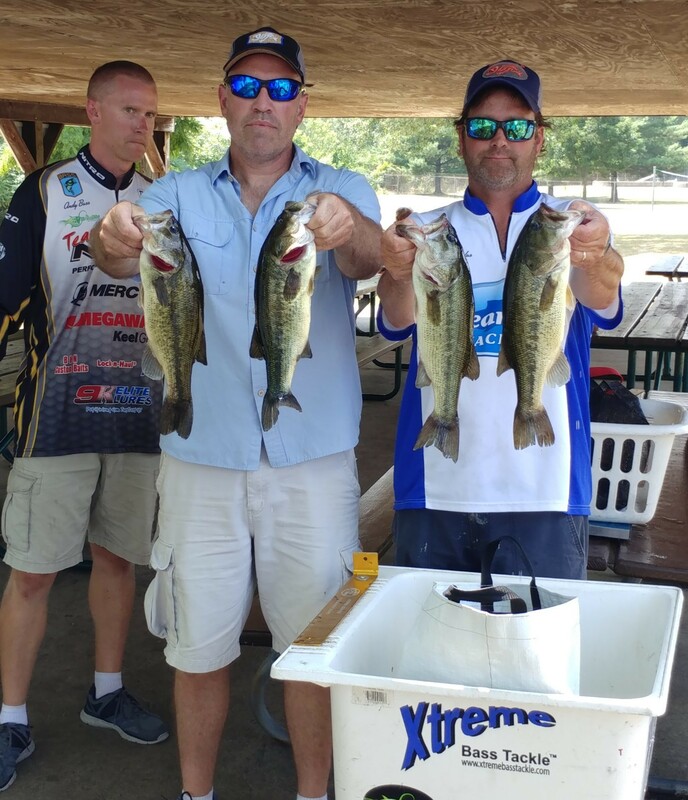 Once I got it out from wrapped around to log, the boat had drifted back enough it was a quick retrieve and Andy made himself useful back netting it." attracted bluegills, which attracted bass." Specifically, they targeted overhanging trees that were loaded with the bugs. Unfortunately, they were never able to cull. 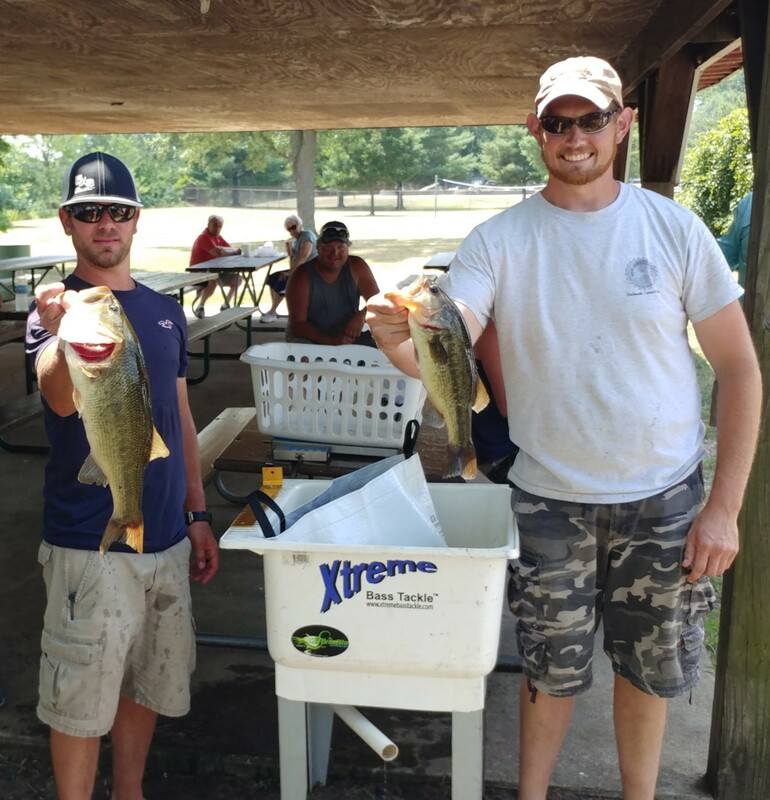 2nd Big Bass: The team of Shaun Callaway and Jeremy Larson (left) boated a 4.25 pound beast to win $70. 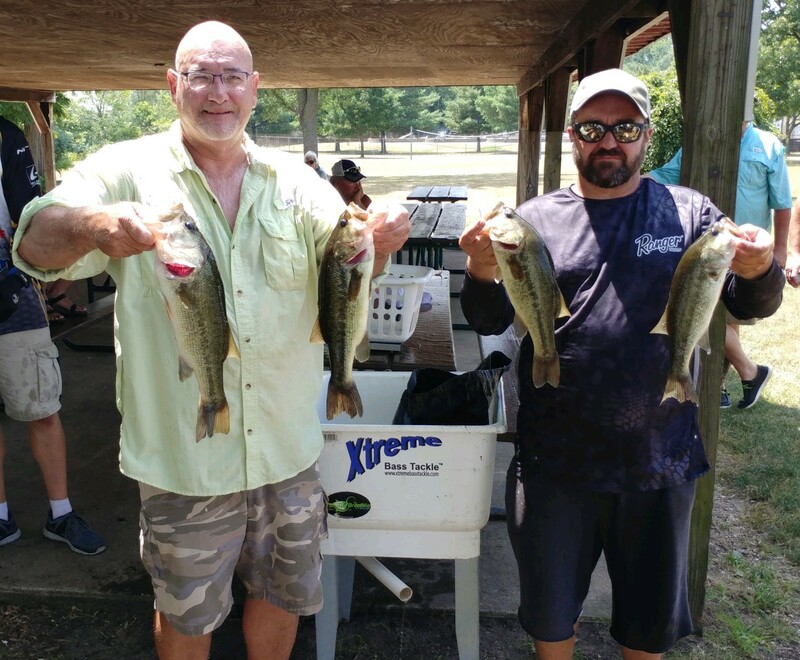 ​​6th Place: ​​Terry Schoettmer (right) and David Brown weighed 3 fish that went 6.82 pounds. 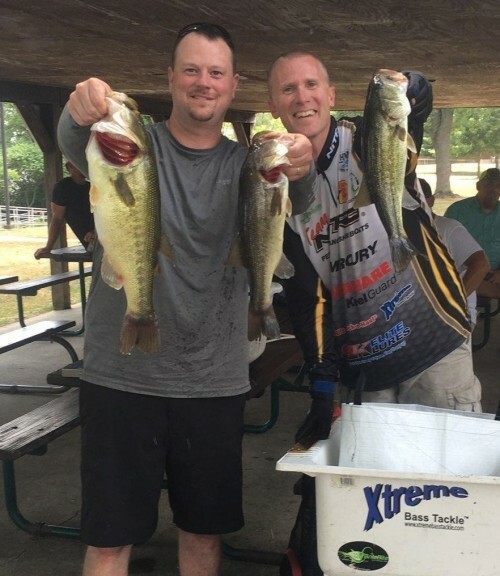 They had a 4.10 pound largemouth to lead the way and won $110. They came to a log at end of some boats with current running up against it. Hollabaugh recalls, "As I was reaching for my Senko, Don is yelling, 'Get the net!' And he lands our biggest fish. Then, as I'm putting it in the livewell, he is yelling, 'Get the net!' again!" At the river, they rotated through 5 spots. "When I say 'spots,'" Paulus said, "I mean it would be one or two pieces of wood. 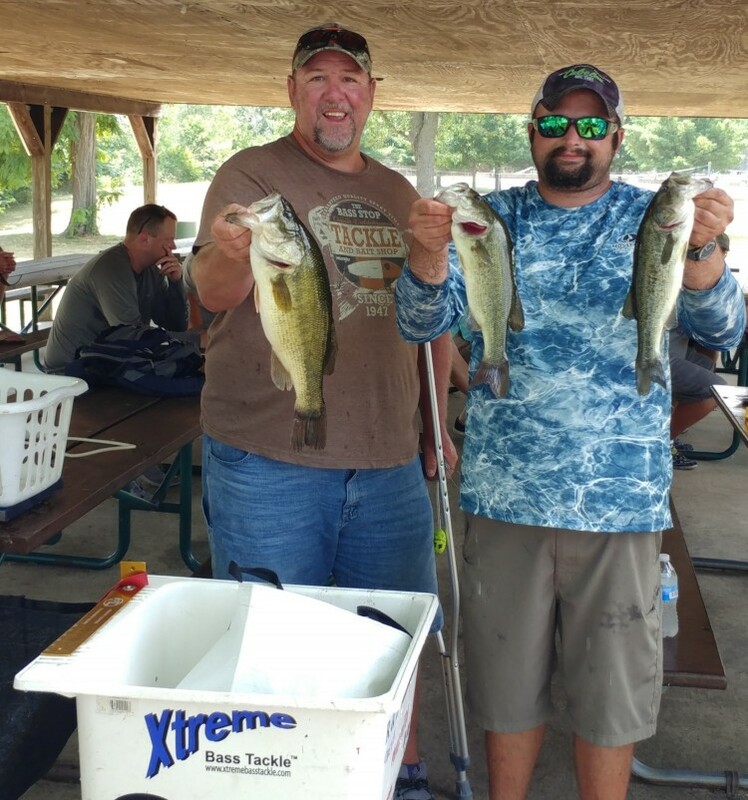 The shallow spots we fished also coincided with the bluegill spawn going on." 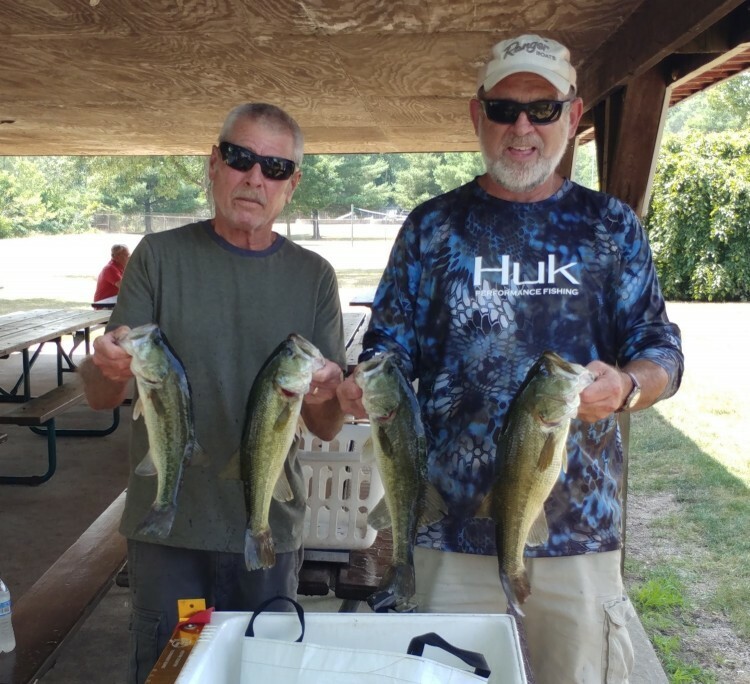 By 10:30 they had their limit, and they culled 2 times. 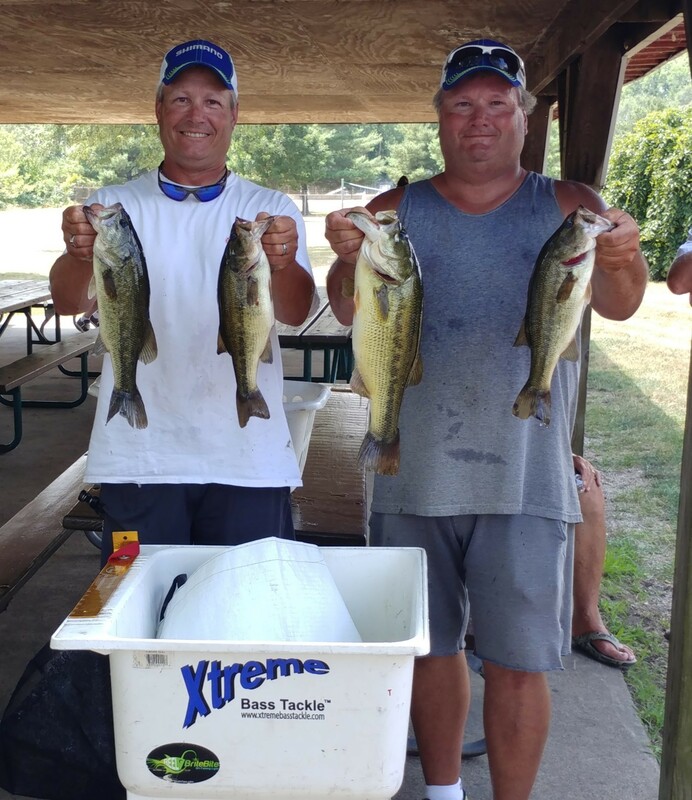 7th Place: South Division directors, John Gipson, Jr., and Tom Noe, who are also second on the All-Time Money Winners and Top-5 Finishes lists, weighed 3 fish that weighed 6.29 and won $95.